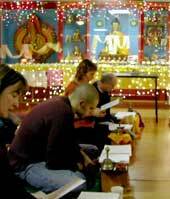 The literal meaning of puja is “to please.” And the best way to please our teachers and the Buddhas is through our practice. Intellectual study alone is not enough to completely transform the mind. We also need to engage in intensive practices for purifying the mind and accumulating virtue, complemented by heartfelt prayers. These practices typically commemorate a milestone in Shakyamuni Buddha's life or honor a holy being in the Buddhist Vajrayana tradition. We hold pujas or ceremonies around a particular Buddha or holy being several times each month. These group practices involve visualizations, verse recitation and presentation offerings. Buddhist holidays are traditionally celebrated by taking the 8 Mahayana Precepts, a practice held several times each month according to the lunar calendar. These practices are all the more powerful when performed in a group. Everyone is warmly invited to join us for the pujas we hold at the center. At first they may seem strange and complicated, but after a while you will learn how to engage effectively in these ritual practices. Pujas are celebrated on dates determined by the lunar calendar. See our calendar for the dates and times of our pujas.